Frame crafted of Larch hardwood valued for its tough, water resistant, and durable qualities; famous example of its longevity is its use in the construction of the ancient city of Venice. 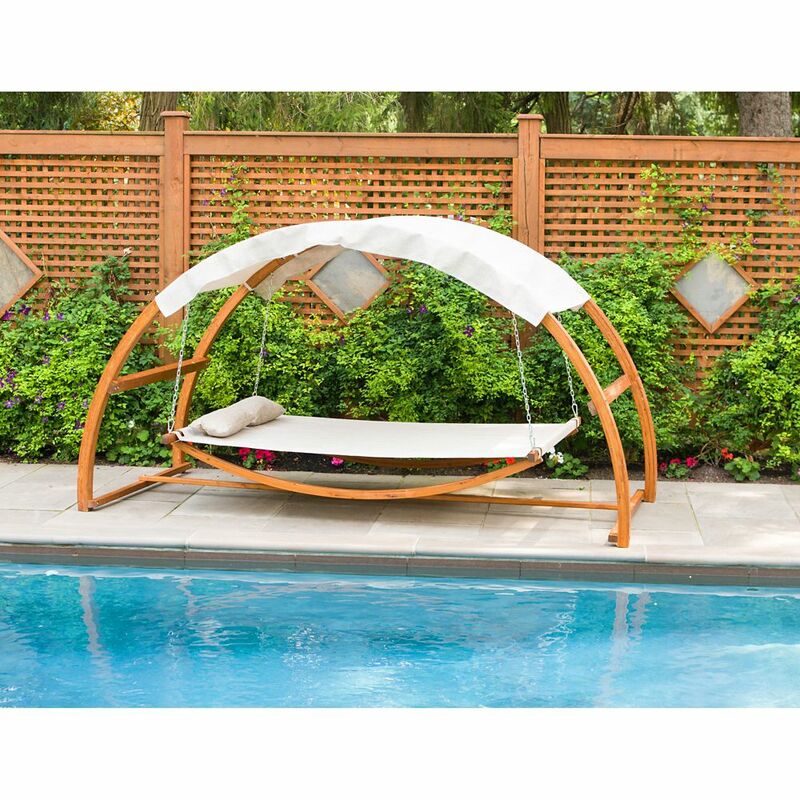 Read a book, relax by the pool or enjoy some beautiful sunshine on this comfy Deerfield Wicker Patio Daybed. The retractable canopy keeps shading to your liking and the ability to sprawl out will put you at ease. It is durable and attractive, with heavy duty steel framing, a brown resin wicker shell and weather-resistant blue/beige olefin cushions. Swing Bed With Canopy Covered hammock, swing bed with canopy with adjustable height. When life is full of swing, you want to maximize your down time. This swing bed with canopy lets you relax all day and if you desire, through the night. With a modern twist to the traditional backyard hammock, our distinctive concept sets the style for superior comfort, warmth and personality. Whether positioned in the garden or on the terrace, this contemporary hammock feels like an uninterrupted weekend getaway. Swing Bed With Canopy is rated 3.5 out of 5 by 13. Rated 2 out of 5 by HonestShopper from It worked well for about a year. The thing to consider is the canopy. After one year the canopy g... It worked well for about a year. The thing to consider is the canopy. After one year the canopy gets stained with dirt which cannot wash off. Makes sense as the outer portion of the canopy is always exposed. Hence the color of the canopy should be darker, but it isn't. Rated 4 out of 5 by Anonymous from Love it It is everything I wanted, except the assembly instructions, which were incorrect and unclear. Rated 2 out of 5 by azlady from Once this is finished it is awesome! However, This was ONE OF THE MOST HORRIFIC THINGS TO ASSEMB... Once this is finished it is awesome! However, This was ONE OF THE MOST HORRIFIC THINGS TO ASSEMBLE EVER! (Yes it deserves all shouty caps). There were two of us, and we have assembled many things in our day, but this had the worst assembly instructions ever. It labels the parts on the page, but they are not labeled at all on the actual pieces. Then the drawings do not actually represent the actual pieces needed for the step needed. At about step 4 it stops giving any kind of direction as to what to do next, or the screws needed, or any kind of order, and just starts showing some vague pictures. BIG NOTES: before you assemble the bed frame you must place the crossbars thru the bed fabric. (This is not noted in any way shape or form). ALSO THE CROSSBARS ON THE OUTSIDE FRAME GO ON THE INSIDE NOT THE OUTSIDE AS SHOWN!!! Def. layout all of you parts and label beforehand as well as have at least two sets of hands! Home Depot Please work with this vendor to fix these issues. Rated 4 out of 5 by dsc2bjn from Love the bed. Coverings for the feet would really push it to 5 stars. Not only would it help ke... Love the bed. Coverings for the feet would really push it to 5 stars. Not only would it help keep water from seeping in causing rot, it would help protect from damaging the bed when moving it around. I am currently using silicon moving pads to move it on the patio to keep it out of the rain. Instructions could be easier. The image shows the bracing on the outside of the arch over the bed, but it actually goes on the inside. The tie bar on the bottom is shown to standing on edge, but it actually lays flat. Rated 4 out of 5 by lelandh2002 from The surface is rather firm, but still comfortable. Doesn't completely block the sun, the "roof" ... The surface is rather firm, but still comfortable. Doesn't completely block the sun, the "roof" has multiple tiny holes. What is the maximum weight load for this hammock/bed? The weight capacity for this item is 500lbs.